You think back to some of the bigger trials and challenges and realize how much easier things could have been if you’d known what you just now read. That’s what I thought to myself last weekend as I worked my way through Jenny Blake’s new book, Life After College: The Complete Guide to Getting What You Want. Of course, this book didn’t exist ten years ago, so there’s nothing I could have done about that, but it exists now, and even though I think I’ve done an alright job of figuring things out on my own in the meantime, I’m pretty happy to have run across a resource like this. 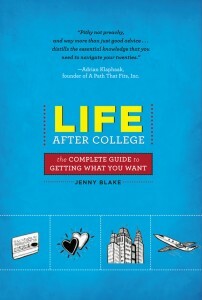 Life After College is really more of a workbook than a novel or how-to guide. This isn’t the kind of book you read through in an afternoon, put down, and say, “That was nice.” It’s one where you get out the pen and start writing in the margins on every other page. Of course, you can’t always avoid learning your lessons the hard way, and sometimes you don’t even want to. But, when a good opportunity comes along—and it costs less than $9—take it, I say. You don’t need to be a college student or twenty-something to learn a valuable lesson from a book that was written for one just like you don’t need to be a monk to learn about meditation or a banker to learn about money. Getting what you want is an applicable endeavor at any age or position in life and the strategies for doing it are timeless. Also, I’m not affiliated with Life After College, so I don’t get anything for recommending it. I just think it’s a book worth reading and, more importantly, putting to use regardless where you are in life. Congratulations to Jenny, a long time e-friend (in internet years) for writing such a powerful book. I only hope that when I get around to writing one myself, I’ll create something half as good. If you’d like a copy of Life After College for free, I have a fun idea. I’m giving away my own copy with all of the worksheets filled out so that you can get a glance at how I plan to get what I want from my life. If you want a chance to win, just retweet this article and be sure to include @tylertervooren in your tweet so that I don’t miss it. I’ll pick a random winner by tomorrow evening and ship a copy anywhere in the world.